Editor’s note: The content of this article pertains to bodily functions. Reader/viewer discretion is advised. 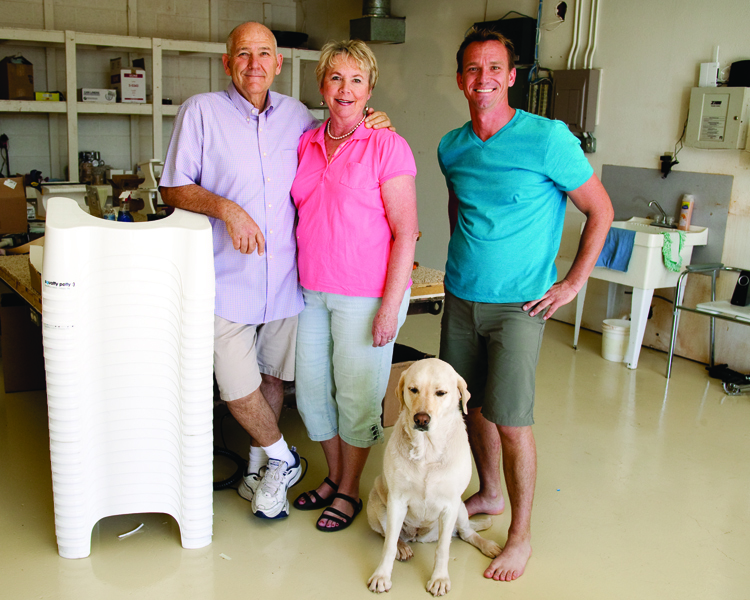 Bill, Judy and Bobby Edwards created the Squatty Potty in their garage in 2010. At the time, Judy was experiencing colon problems, and a medical professional recommended that she raise her knees as high as possible while using the toilet. She tried putting boxes, books, and stools under her feet to help raise her knees but these objects got in the way when they weren’t being used. “We stubbed our toe on it a couple times at night,” Bill said. Eventually Bill and Judy Edwards’s son Bobby Edwards decided he would custom-design a stool that would fit around the toilet to help Judy achieve the position her doctors wanted. Bobby Edwards worked on the project in the Edwards’ garage. He went through several prototypes and finally found one that worked well and brought Judy relief. The Edwards thought they might be onto something, so they made more Squatty Potties for the 2010 holiday season and gave them to friends and family. People loved them, so Bobby Edwards started a website to market and sell the product. Squatty Potty sold well online – the Edwards have shipped them to every state and to 17 countries. For most of this time they continued making the product in their garage. In fact, they’d just barely moved production into a local warehouse when the “Dr. Oz” show called. When the “Dr. Oz” show called, Bill Edwards initially thought it was a prank phone call from one of his kids. Bill Edwards quickly realized the call was real. He shipped a Squatty Potty to the “Dr. Oz” studios so they could film a segment. The show’s staff told him they’d likely run the Squatty Potty segment at the end of May or early June. The Edwards were surprised when orders and phone calls started pouring in this week – it turned out that the “Dr. Oz” show ran the segment early. “It really caught us off guard!” Bill Edwards said. Since the “Dr. Oz” showing, the Edwards’ sales have gone up by “four, five or six times,” Bill said. “We were a little unprepared – we thought we had a couple of weeks to get prepared, kind of gear up for it, so we’ve been kind of scrambling,” Bill Edwards said. For nurse practitioner Meg Tolbert, advising medical patients with chronic constipation is all in a day’s work. At Stanford University’s Pelvic Floor Clinic, Tolbert said she has learned the absolute and critical importance of instructing patients about the age-old practice of squatting. And though the idea of squatting to go potty may seem primal to some, to others it has become a common-sense solution to the frustrations associated with constipation and chronic outlet obstruction. “Before indoor plumbing and porcelain bathroom fixtures became luxuries of Western civilization, we were all squatters,” said Bill Edwards. Referring to X-ray defecography, Tolbert said that squatting ensures that the knee-hip angle positions the anorectal angle into an alignment that is the most effective for bowel evacuation. “The alignment of the anorectal angle that is accomplished from obtaining a squatting position permits an effective and necessary bowel evacuation,” she said. Southern Utah OB-GYN Dr. Craig Astle refers many of his female patients to the Squatty Potty. “Not only is this stool … convenient, it just makes sense,” Astle said. During menopause, many women experience issues like tissue weakening, pelvic prolapse, hemorrhoids, chronic constipation and other circumstances that lead to rectal discomfort, the doctor said. The Edwards employ several people in St. George and are planning on expanding their operations. They aren’t planning on leaving the St. George area. The Edwards are aware that the Squatty Potty can cause some uncomfortable conversations, so they use humor when they can. “I tell everybody, me and my wife’s been married for 45 years and this last year we’ve had conversations like we’ve never had before in our life,” Bill Edwardssaid. You can view video of the “Dr. Oz” segment at this link. Learn more about the Squatty Potty online. My comment above should have read – My close friend who is 8 months pregnant will not go without it, and she said it helped her so much during her pregnancy..
As someone who has struggled with colon issues my entire adult life, the Squatty Potty has been a God-send! You know it’s great when your 20 yr old kids beg for one in their own bathrooms. I love my squatty potty and recommend it to everyone of all ages!! It is sad that they are deceiving people about what it means to squat. But the Internet will not permit the truth to be suppressed for long. The world will return to true squatting and will gain the full benefits eventually. While your efforts to educate the world about the benefits of squatting to defecate are certainly laudable, I think it’s disingenuous of you to harp on the Edwards for promoting the footstool method. Even if squatting truly is the perfect technique, the footstool method, while not the best, is certainly an improvement over your standard sitting position. Also, for some people, especially older people and those who are disabled, squatting is simply too strenuous and dangerous, but the footstool can give them many of the benefits of squatting without that physical strain and danger of falling over. The footstool being sold by the Edwards is well designed, has a catchy name and even comes in bamboo. Your product appears to be awkward and cumbersome. These are simply my observations from a business perspective. From that point of view, and with the recent endorsement by Dr. Oz, the Edwards are well positioned. Don’t let jealousy get in the way of recognizing that the Edwards are simply meeting a need. People need to evacuate their bowels properly. Your product certainly accomplishes that, it’s just that the Edwards have done it better, at least in marketing, anyway. I agree that some people who are elderly or disabled will never be able to squat. A footstool is the best they can do. But to tell able bodied people (even children!) to use that method is completely irresponsible. There is no evidence that the benefits of squatting can be achieved without squatting. I’m not surprised that you assume I’m motivated by jealousy. In fact, I have no desire to sell lots of Nature’s Platforms. 95% of the time my site doesn’t even allow people to order. The product is just a “pretext” to discuss a taboo subject, and to educate the world. It also allows me to keep the site going and pay the rent. My purpose is to root out ignorance, and it’s frustrating to see my research exploited to spread even more ignorance. Yes, the Squatty Potty is successful in a business sense, but it’s a complete disaster in terms of public health. There are many other scams out there that seem “successful” — at least for a while. Do you have some special credentials or solid conclusions from peer-reviewed research that gives some credence to your claim that squatting is the only way to go? You claim it’s irresponsible to encourage this method because there’s no evidence that the benefits of squatting cannot be obtained without squatting, and yet people are reporting that this footstool helps them, which is fine. There’s certainly no evidence that it’s harmful, so what’s the problem? The evidence that the western toilet is harmful is indisputable. (See all the research on my site.) So, ultimately, we have to get rid of it, and relegate it to a device for the handicapped. But as long as people think they can hang on to the western toilet by just using a footstool, we’ll never get rid of it. Actually, I’ve reconsidered my attitude toward the Squatty Potty. It serves a purpose in “breaking the ice” by getting people to realize that something has to change. Later on they’ll realize that a much bigger change will eventually be necessary. You sound like a jealous cynical old man. 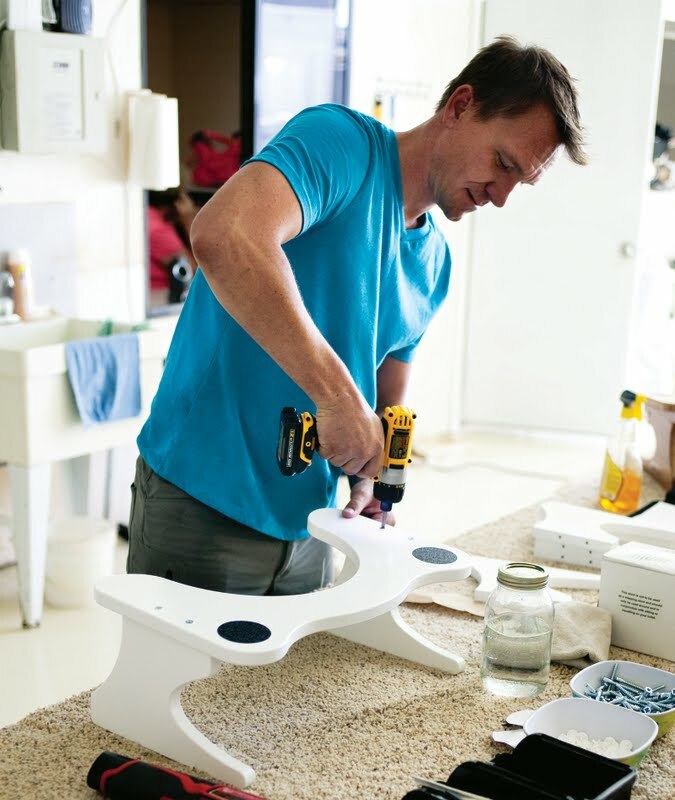 I have tried the squatty potty and it works great for my whole family. Has cured my bad case of hemorrhoids when nothing else would. If you for one moment think that everyone that has been sitting on a toilet their whole life is going to start squatting over a hole in the ground, Duh!!! that will never happen. Unless you are raised squatting you do not have the ability to even do so. It takes a long time the stretch the muscles and tendons in your legs to achieve a full squat. For those who can and do squat great, But for you to say the stool does not do the job and it is a scam (JUST LOOK AT THEIR TESTIMONIALS) is an out right lie and you should be ashamed of yourself. Most people and have a hard time getting up off their toilet let alone squatting over a hole. As for me and my house we are squatty potty fans. The biggest proof is in the POT!!! Thanks for your comments, Kate. You sound like a sweet, gentle person. May the “force” be with you. do you have a store in st George. if not, he should have one…with a fitting room.